This week was pretty humbling. Sometimes you can work your hardest, strive to be completely obedient, and feel like you’re just pushing a mountain without even making a dent in it. Investigators that you thought had lots of interest will return the Book of Mormon you gave them and tell you they don’t want it, you talk to a hundred people without any success, and the every appointment you make seems to fall through or cancel. It’s sometimes easy in these times to get down and think that nothing is paying off, but I know that Heavenly Father allows us these hard times so we can more fully rely on Him, and so we can exercise and build our faith through a continued diligent effort. And now, my beloved son, notwithstanding their hardness, let us labor diligently; for if we should cease to labor, we should be brought under condemnation; for we have a labor to perform whilst in this tabernacle of clay, that we may conquer the enemy of all righteousness, and rest our souls in the kingdom of God. Even though Mormon and Moroni lived in a near-barbaric time, they knew that they must press on and continue preaching and laboring diligently to save souls. Even if times seem hard, Heavenly Father will always hear our prayers, and give us the strength and ability to accomplish what He would have us do–even if it’s nothing more than just a faithful continued effort against a pile of opposition. I know Heavenly Father lives and loves us so much! So I got my new companion. 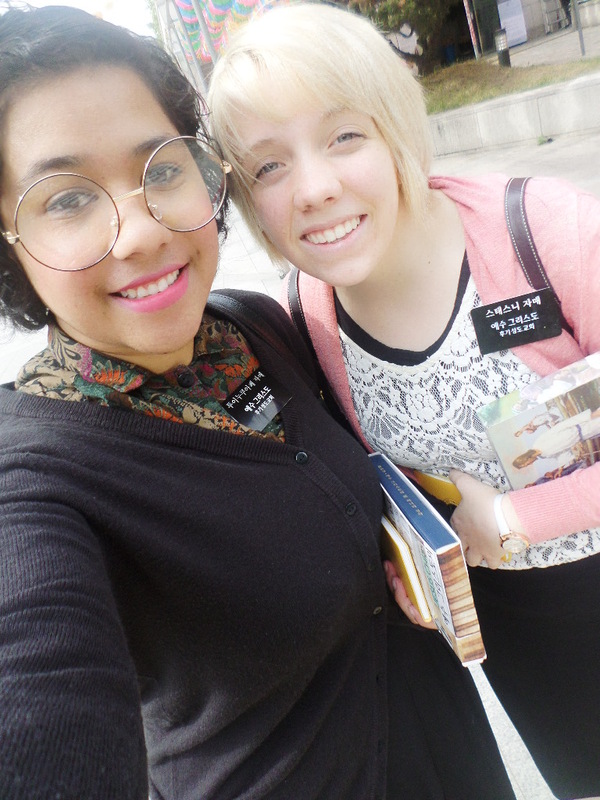 She’s from Australia (which I’m so happy about because that means I’ll start and end my mission with an Australian)! Her family is originally from Tonga and her name is Sister Tui for short. I’m super excited to serve with her. It’s actually really cool because I had received a prompting about two months ago on March 11 to start praying for the people in the MTC, and it was so interesting that I had actually written about it in my journal. But then I had forgotten about it. I asked Sister Tui about the date and she told me that day (in Korea) would have been the day she entered the MTC in America! So cool! It’s FATE! One of the first lessons we taught together was actually with a missionary from another church. We were talking to people on the street when I ran into this lady, and we were both excited to share with each other what we believed so we set up an appointment to meet for the next day. To be honest, the church she was from has a really bad and scary reputation in Korea and I had heard a lot of bad experiences from other people about this church which made me second guess whether it was right or not to meet with her. We prayed about it and felt that whether she would accept or reject what we believed, we should still give her a chance to know more about it. We also felt that regardless of all the bad things we had heard about the church, we should focus on seeing her as God sees her, and treat her as such. Our meeting with her was a bit wild, but because we had decided beforehand that we were going to treat her as God wants us to, we didn’t bash any beliefs. She tried a lot of the time to convert us to her beliefs, but we told her upfront that because we had read the Book of Mormon and gained a witness of its truth for ourselves, we couldn’t turn away from what we knew was true. We listened to her beliefs and testified of the truths that were in it; then she listened to what we believed. In the end we concluded that both of us didn’t have any plans on changing religion soon, but that we respected each other for what each of us were doing. A situation that could have caused a lot more contention ended in us nicely getting smoothies together. It taught me that we should see everyone as God sees them, and eliminate any judgement that could lead to negative or un-Christlike feelings. It was a fun week with a lot of lessons learned! It was so fun talking to all of you! Mother’s day is definitely one of the funnest days of the year as a missionary! Guess what soup this is?! 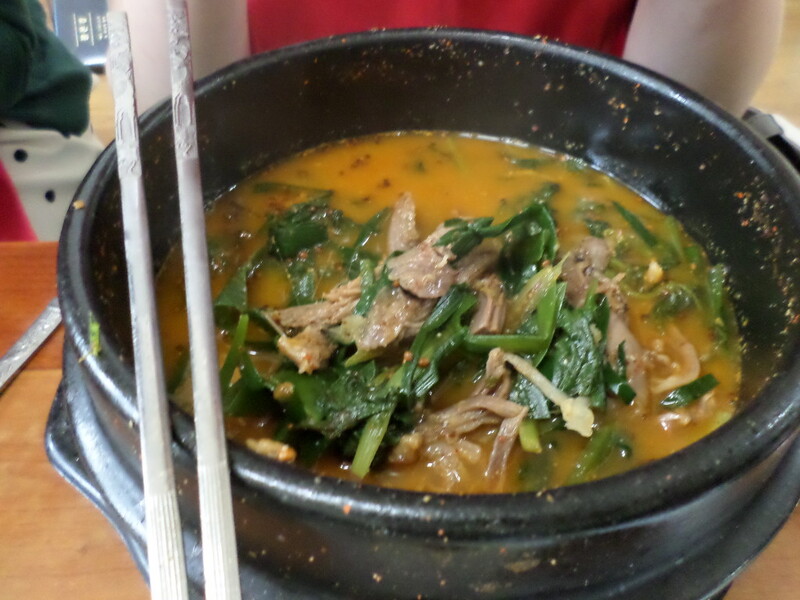 This week we did a couple of things–ate 보신탕(bo-shin-tang), I’ll just let you look up what that is. It was expensive, but it was so delicious! We also had transfer calls! My companion Sister N is going to her greenie area in 인천 and I’m staying in 영등포 and going to train! Yah! I’ll figure out Wednesday this week who my new companion will be so I’ll let you know next week! I’m really excited! One of the miracles we saw this week happened from attending a soccer game! Our ward and another ward usually meet Saturday mornings and play a game or two at a junior high field. Last week the sisters from the other ward had met a potential investigator there so they invited us to come this week to meet her. She’s so great! She’s a Korean, but lived in Africa for 3 years so she’s really good at English. She teaches English at the junior high and is really big into service and adventure. 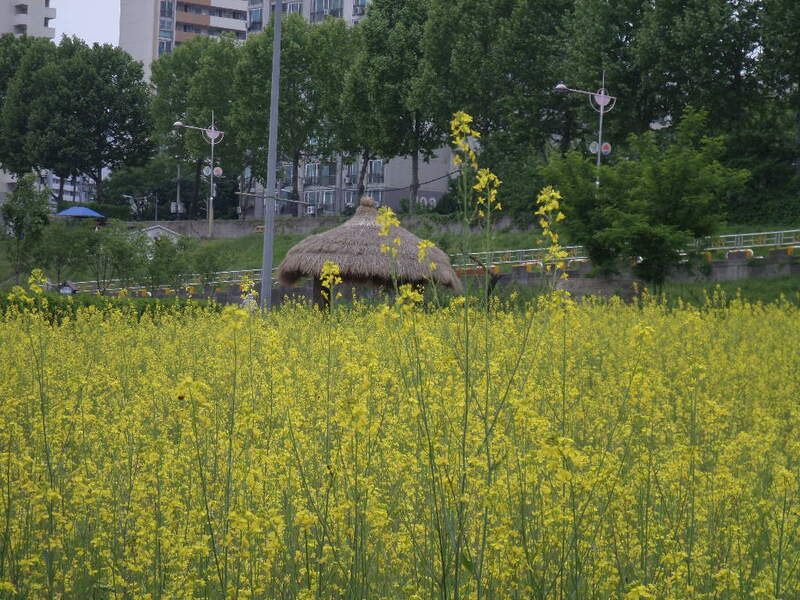 She thought that what we were voluntarily doing as missionaries here in Korea was amazing. We talked a little with her and then she invited us to share with her class for 10 minutes what we were doing here and why. What!? It was a crazy cool opportunity and the students were genuinely interested. Lots of the students had seen missionaries on the street before but felt intimidated or shy so had never talked to them. It was fun explaining what we were doing here and why. The teacher texted us later that day and said that she and her class were really inspired by what we had said and by what we are doing! It was such a neat opportunity! Especially since, we had been praying and fasting for a new person to teach for a long time and this was an answer to our prayers! God is the best! I’m excited to see what miracles this next week brings! It’s funny how sometimes things turn out differently than you expect. This week we had planned to drop by on a member’s house, but both me and my companion felt like we should change that to go and see our favorite grandma in our ward. We started heading over there and had a prompting to bring something to her. We went into a shop to buy some fruit, but instead felt like we should buy a delicious drink (aloe water-yum!). I gave her a call when we were approaching and she answered “오지마!” “”O-ji-ma!” Dont come! – because she had been feeling pretty sick and didn’t have any food to give us (like is custom when you visit a Korean’s house). I persisted a little and told here that we had already eaten, and just wanted to give her a present. She told us not to. I told her we had already bought it, so she asked if it was 먹는 것 (something to eat), and I told her it was 마시는 것 (stuff to drink) and she told us s to 빨리와 (Come quick). It was probably one of the funnest times I have had visiting a member on my mission, but it didn’t initially start off that way. She seemed a little down and lonely when we first got there- so we mostly listened as she explained how she’s been hurting lately and how she misses her husband that passed away a couple years ago. We listened, then she turned on her old-times Korean music. I started doing a little dance to it (just being my dorky self), and she thought it was so funny so she started doing it too- then next thing we know we’re just silly dancing for the next 10 minutes. Sister Lee (our Korean grandma) just had a huge smile on her face and even got up and danced as much as she was able to. The whole time she just insisted that we must have had professional lessons in America (even though our dancing was honestly terrible) haha. I just looked at Sister N as we were doing our little jig and smiled. Would I have ever thought my mission would lead me here– dancing to old Korean music to make a grandma smile? Not really. But I could see that even though we felt ridiculous, we were brightening her day helping her get her mind off other things. She thanked us afterwards for cheering her up and for sharing a small scripture message. It’s not really what we had expected, and I don’t think it would be appropriate for a lot of other situations, but we all felt happier and lighter afterwards. I feel like Heavenly Father works through us, and our unique and quirky personalities- whoever we may be, to help others when we are trying to do what’s right. Missionaries don’t have to be robots that visit, share a routine and outworn message, ask for a referral, and go. We can be ourselves, and rely on the Lord to work through us as we are and as we may become, to help and uplift others. I LOVE BEING A MISSIONARY! I’m always excited for what the next day will bring and I’m excited for what the next week will bring!